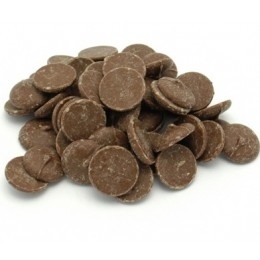 Ambrosia milk chocolates create a rich and flavorful coating that’s simply irresistible. With a flawless blend of dense cocoa and light sweetness, these smooth and creamy coatings enhance any dessert as a hard, snappy shell or a soft, glossy glaze. Royal Wholesale makes ordering Ambrosia chocolates easy, so you can enjoy this incredible indulgence however and whenever you’d like. We believe that everything tastes better covered in chocolate, but only top quality chocolate will do. That’s why we offer Ambrosia chocolates. For a perfect addition to your ice cream, cookies, muffins and more, load up your shopping cart with delicious Ambrosia chocolate coatings.